M.D. students enter the medical program and enroll in the Human Structure Function series in January, remaining in the program for 52 consecutive four-week blocks. For students who wish to graduate in May of the final year, the program allows for up to five blocks of leave of absence. Students not interested in this option will graduate in December of their final year. 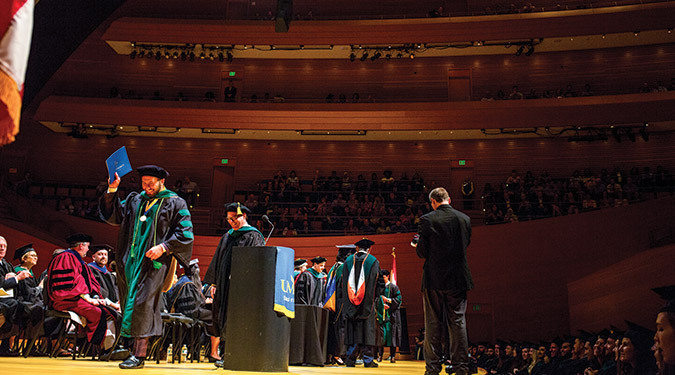 The curriculum and graduation requirements for M.D. students are outlined below. *Students may take six to seven electives in Year 4. They must choose three clinical electives from nine designated categories. One of these electives must also be a critical care elective. Continuous enrollment in the School of Medicine for 52 four-week blocks (including four blocks vacation). Four vacation blocks (one per 13-block period) during the 52 blocks of enrollment. Enrollment in all required School of Medicine rotations and courses with students in Years III through VI of the six-year program including the Self-Paced Pharmacology Series. All students will be required to complete a one-block medical humanities course in the last two years. Completion of three electives from nine categories with one elective fulfilling the critical-care requirement.